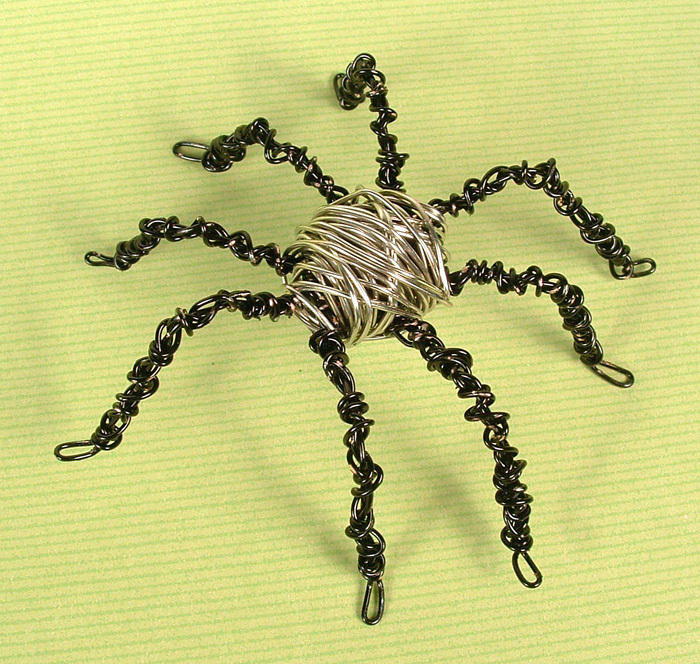 I first heard about putting a spider ornament on your Christmas tree from Cheri years ago, but had never heard the story until recently. I have put a spider in my wreaths and decorations for years now. He is a simple fellow. 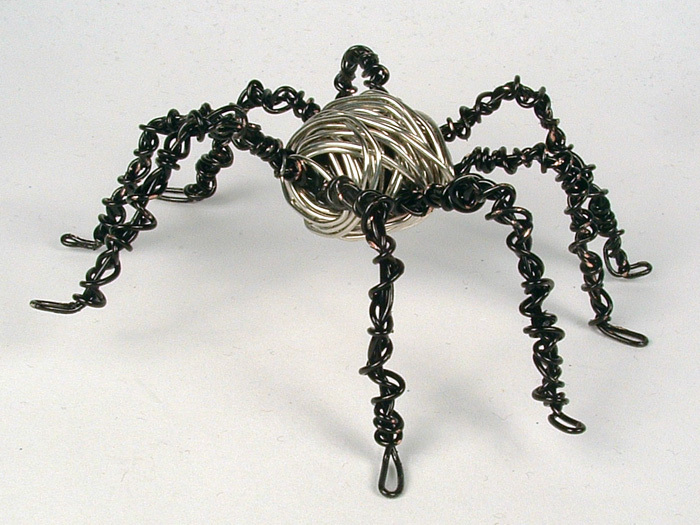 His legs are made with black bead stringing wire and the body is the same wire in silver. He only took me about an hour to make, but will last a long time. And in case anyone wants to read it, here is the story behind the Christmas spider. On Christmas Eve, a gentle mother was busily cleaning the house for the most wonderful day of the year, Christmas Day, until not a speck of dust was left. Even the spiders had been banished from their cozy corners and had fled to the farthest corner of the attic. The Christmas tree was beautifully decorated. The poor spiders were frantic, for they could not see the tree, nor be present for Santa’s visit. Then the oldest and wisest spider suggested that perhaps they could wait until everyone went to bed and then get a closer look. 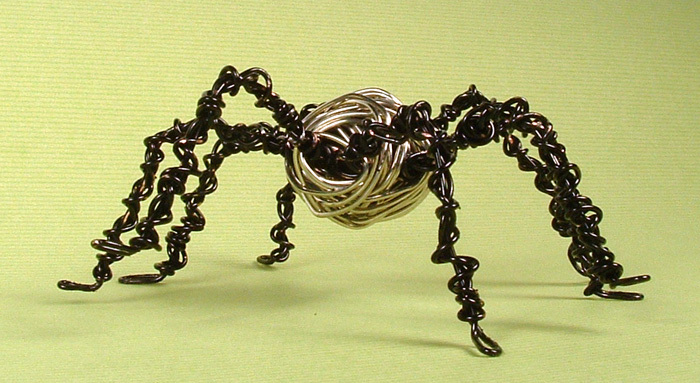 When the house was dark and silent, the spiders crept out of their hiding place. When they neared the Christmas tree, they were delighted with the beauty of it. The spiders crept all over the tree, up and down, over the branches and twigs and saw every one of the pretty things. The spiders loved the Christmas tree. All night long they danced in the branches, leaving them covered with spider webs. When Santa Claus came with the gifts for the children, he saw the tree covered in spider webs, and smiled to see how happy the spiders were, but he knew the mother, who had worked so hard to make everything perfect, would not be pleased when she saw what the spiders had done. With love in his heart and a smile on his lips, Santa reached out and gently touched the spider webs. The spider webs started to sparkle and shine! They had all turned into sparkling, shimmering silver and gold. Ever since this happened, people have hung tinsel on their Christmas trees and included a spider among the decorations on the Christmas tree. I love this. The spider is adorable. Love it! I may have a new tradition!